Integrating check SMS balance feature is easy when using iSMS API. Below is an example of integrating iSMS features in your VB.NET application. All available features and configurations will be displayed at the iSMS Developer API page. Integrate our SMS API into your VB.NET application and enjoy our SMS services. 1. 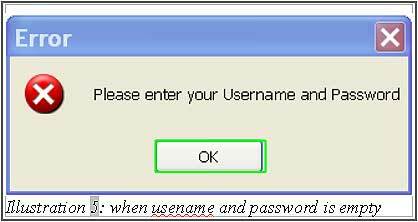 First of all, user will able to see this form as illustration 1. 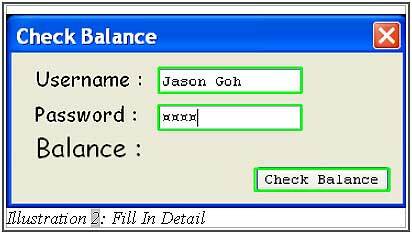 This form is to check balance on their bulksms account. 2. 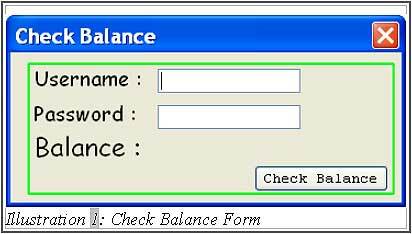 User have to key in their username and password and click on "Check Balance" button to proceed. 3. 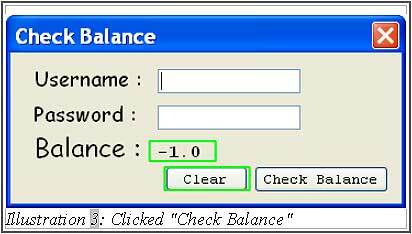 After clicked on "Check Balance" button user will able to see their balance as illustration 3 below. And clear button is pop out. This button purpose is to clear form. 4. 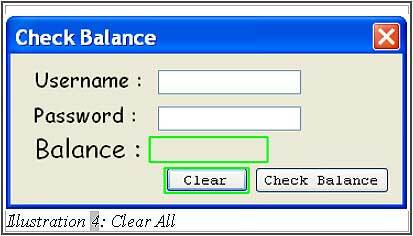 To check next account balance, user can click on clear to clear form or direct key in username and password to proceed. As user want to check balance have to go through from step 1 to 2. 5. Error Message will show up as illustration 5 below. When user did not click on anything and direct press on "Check Balance" button. Click on "OK" to continue. Below is some sample script for your reference.